The public was not informed as they should have been according to NEPA of your proposal https://www.blm.gov/ut/enbb/files/Onaqui_Fertility_Control_EA_2_18_15.pdf The scoping period’s notice was hidden, and the EA’s comment-period was cut in half. These actions show a lack of transparency on the part of the BLM and mocks the public process to participate with comments. We request you start over with a full 30 day public comment period. We are against the outrageous proposal to forcibly drug any wild Onaqui mares with PZP- – the EPA restricted-use pesticide also known as ZonaStat-H.
( http://www.epa.gov/pesticides/chem_search/reg_actions/pending/fs_PC-176603_01-Jan-12.pdf ) The drug sterilizes wild mares after multiple use and disrupts natural herd dynamics amongst other horrors. How many times has each Onaqui mare or filly been drugged previously? Drugging any wild filly under the age of 2 is barbaric. Her reproductive system has not developed completely. Forced drugging of fillies and mares until they are 6 will ruin their chances of ever producing healthy offspring who can survive the environmental changes ahead. We request you do not use PZP or any other sterilant or sterilizing procedures on the Onaqui mares for fertility control or for any other reason. Experimentation and roundups must stop now. Roundups increase global warming and must stop immediately. The vehicles and aircrafts used to implement the proposed PZP programs also increase global warming as well as harm the fragile ecosystem on the Onaqui herd management area. We endorse the no action alternative and ask that you do not remove any Onaqui wild horses as their population numbers are too low now. Land-use plans should be modified to have a higher AML ensuring herd survival and genetic variability with predators such as mountain lions protected. Holistic management should be used from this day forward for recovery and to adhere to the minimum-feasible-management requirement of the 1971 Free Roaming Wild Horse and Burro Protection Act. Our members enjoy observing, filming and photographing the Onaqui herd and would be devastated if the mares or fillies would receive PZP or any other sterilizing agent that will ruin natural herd behavior and the survival of the herd. Marybeth Devlin’s extensive comments will give you some ideas but it’s important to send in your comments using your own words. Keeping it short and sweet is fine. The point to get across is that you don’t what them to be drugged up with an EPA pesticide that sterilizes after multiple use, no roundup and no removal. Request BLM incorporates holistic management for successful management of wild horses on public land. The EA claims that, prior its publication, the required public-scoping was conducted. However, instead of issuing the standard news-release, BLM restricted notification of the scoping-period to a posting on the “Utah BLM Environmental Notification Bulletin Board” (ENBB). However, how would the public know to look on this ENBB, when it is not even one of the options on Utah-BLM’s online “Information Center”? Not surprisingly, the EA reports that only two comments were received, both in support of BLM’s intensified fertility-control plan and for “managing wild horses on the range within AML.” And who were the two parties that submitted comments in support of birth-control for the Onaqui wild horses and for keeping them within AML? The first was Iron County, whose commissioners had threatened last July — following the Cliven Bundy standoff — to round up wild horses themselves. Advised that doing so was illegal, Commissioner Dave Miller then co-sponsored a resolution for the states to take over management of the wild horses and burros. The second comment was from the State of Utah Public Lands Policy Coordination Office, an activist-agency whose goal is to “retake ownership” of Federal land. Here’s the link to an article about the PLPCO, aptly titled “The Wild Bunch”. How curious that these entities were the only ones who were successful in learning about the scoping period. Did BLM staff alert them to check the ENBB — and where to find it? What the inadequate number of scoping-comments evidences, is that BLM-SLFO did not provide proper notice but instead, buried that notice where it where it would be hard to find. There are many wild-horse advocacy-organizations that certainly would have submitted comments concerning SLFO’s proposed management-plan for the beloved Onaqui mustangs — if they had known the scoping period was open. Corrective Action: SLFO needs to restart this process. Re-open the scoping period and properly notify the public. SLFO needs to compile an ample number of diverse comments. The Wild Horse and Burro Program is national in its constituency. Input regarding its management cannot be limited to a few local anti-wild-horse entities. As if the secretive posting of the scoping notice were not bad enough, SLFO is providing only 14 days for comments on this EA. The standard period is 30 days. By shortening the comment-period by half, SLFO appears to be limiting public-input for a second time — now at the EA-stage of the process. Corrective Action: This EA must be rescinded until SLFO has completed the re-opened scoping process. Then, when SLFO issues a revised EA per the scoping, a full 30-day comment-period must be offered for public-input. However, to save everyone’s time, the best action is to select the “No Action” alternative, which appears to be the correct path, as is evident by an analysis of the facts. The EA seeks to implement a fertility-control plan through the year 2020 to limit the Onaqui herd to 160 wild horses. The current AML ranges from 121 to 210 horses; thus, 160 is below the midpoint between the low and high bounds. The EA says that the short-term goal is to reduce population-growth to “less than seven percent” while the long-term goal is to reduce the need for roundups and removals. To achieve this reduction, SLFO would use the one-year formulation of PZP, and field-dart “select mares.” The darting would be conducted on foot, the EA says, but then clarifies that 4×4 vehicles and off-highway vehicles (OHVs) would be used to “access” the Onaqui HMA. Bait-trapping would be used as deemed necessary. This is not the first time that Onaqui fillies and mares have been subjected to PZP. Previously, however, the formulation used was PZP-22. Starting in late March or early April 2015, SLFO staff would begin vaccinating yearling fillies (which BLM refers to as “mares”) with a “primer” PZP-dose. About 30 to 60 days after that initial injection, staff would administer a second “booster” shot to the fillies. The need to give the second injections within a certain time-frame suggests the fillies might need to be gathered and held captive during that interval. From then on and for the next five consecutive years, “one-year PZP” inoculations would be given. Once a filly-becoming-a-mare reached the age of 6, PZP would be suspended until she produced “a live foal,” after which she would be contracepted “for the remainder of her natural life.” Mares that had previously been vaccinated with PZP — which was the PZP-22 formulation — would receive annual boosters in the time-frame of November through February, but would be subject to dosing at any time of year. The EA is ambiguous regarding how treated mares would be “identified” for staff-use in the field. Reference is made to a “photo database” and to identification “by color, face, leg, and coat pattern markings.” But mention is also made of mares to be “individually marked,” and that a “number of the horses have a hip brand as well as neck brands from previous PZP treatments.” Thus, it is possible that SLFO will disfigure the Onaqui fillies and mares with huge freeze-marks on the hip for staff’s administrative convenience. If so, persons visiting the HMA will have their experience spoiled by the hideous four-inch-high brands on the fillies and mares’ coat. As required by NEPA, BLM presents a “No Action” option. Per this alternative, SLFO would defer the plan to gather and contracept the Onaqui herd to a later time. Until then, SLFO would continue to monitor the HMA’s vegetation and the herd’s population. The “No Action” alternative is actually the best option. Suspend contraception and let natural processes function as they will. Allow a natural ecological balance to revive and thrive in the Onaqui Mountain HMA. Further, PZP is a biohazard, as reflected in the warnings, excerpted below, which are included in the Environmental Protection Agency’s fact-sheet. Personal Protective Equipment requirements include long sleeved shirt and long pants, gloves and shoes plus socks to mitigate occupational exposure. A warning that pregnant women must not be involved in handling or injecting ZonaStat-H and that all women should be aware that accidental self-injection may cause infertility. A recent study-of-the-studies — that is, a meta-analysis — was performed of the research-findings with regard to different contraceptive methods. Among the drugs analyzed were various zona pellucida (ZP) formulations. As it turns out porcine zona pellucida (PZP), from slaughtered pig-ovaries, is not the only ZP contraceptive in use. For instance, a particular ZP vaccine was derived from the ovaries of possums. The irreversibility associated with immunization using ZP posed a major hurdle in the development of ZP based contraceptive. While irreversibility is not a major concern in case of wildlife management where long term infertility is often desirable. Therefore further development in this area resulted in production of various marketed products playing an imperative role in wildlife management. Further studies revealed that the infertility induced in immunized female rabbits was irreversible which could not be restored even after the administration of exogenous gonadotropins. Histological examination of ovaries showed the destruction of oocytes in all the growing follicles along with the depletion of resting follicles. This observation indicated that the infertility was a consequence of ovarian dystrophy rather than inhibition of sperm-oocyte interaction. The immunization of female bonnetmonkeys was carried out using purified porcine ZP3. High antiporcine ZP3 antibody titers were formed and all the animals were rendered infertile. Only 50% of the animals could regain fertility after the decline in antibody titers. Significant curtailment of fertility was also observed by using recombinant possum ZP3 in grey kangaroos. Though the results were quite exciting, histological examination of ovaries of immunized animals revealed the presence of atretic follicles with degenerating oocytes. Definition: atretic follicle — an ovarian follicle in an undeveloped state due to immaturity, poor nutrition or systemic disease; manifested by prolonged anestrus. It is reasonable to conclude that PZP, whether Native PZP or PZP-22, likely has a similar effect on the ovaries, oocytes, and follicles of wild mares. Thus, permanent loss of fertility — even after one inoculation — can result. Important: The meta-analysis’ finding that “… infertility was a consequence of ovarian dystrophy rather than inhibition of sperm-oocyte interaction” appears to disprove the theory posited by ZooMontana, which supposed that PZP “antibodies then bind to eggs in the mare’s ovaries and effectively block sperm binding and fertilization …” (cited in the EA). The new findings show that PZP works not by blocking the sperm but by degenerating the ovaries. 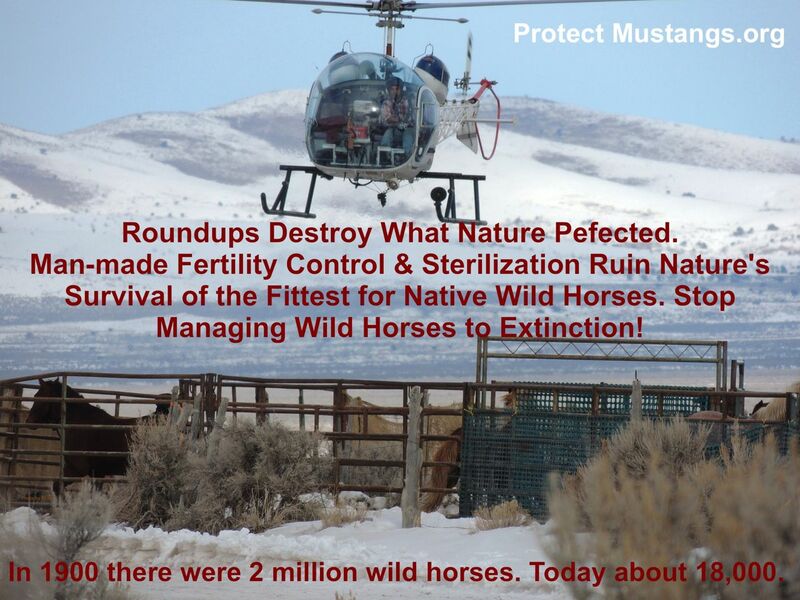 Given these findings, PZP should be abandoned for use in wild horses. The meta-analysis report can be accessed at the link below. 1. Males lose body condition while the oft-claimed improvement in female body condition did not hold up. 2. Females experienced increased irritability, aggression, and masculine behavior. 4. The possibility of “selecting for immuno-compromised individuals” is raised. 5. Finally, the analysis questions the supposed benefit of mares living much longer than their normal life expectancy. With regard to Finding Number 4 above, by continuing and even intensifying the use of PZP, SLFO could be selecting for immuno-compromised horses. If a disaster were to strike the Onaqui Mountain herd, fertility would need to be quickly restorable. PZP would work against saving the herd if it experienced a stochastic event. With regard to Finding Number 5 above, interestingly, the EA cited PZP’s correlation with extended longevity of mares as if it were a benefit. Yet, for purposes of genetic sustainability, increasing the number of long-lived — yet sterile — mares would be disadvantageous to a herd, especially one like Onaqui, which is so low in population already. Recall the EPA’s warning that pregnant women must not be involved in handling or injecting ZonaStat-H. If a mare is administered PZP when she is pregnant, might not her unborn foal be adversely affected by the drug even if the pregnancy itself continued? If the embryo or fetus were female, might the vaccine negatively impact the baby’s reproductive system pre-birth? Might her developing ovaries experience dystrophy? Might she become masculinized as a result? Might she never produce foals, thereby eliminating any genetic contribution on her part? If the embryo or fetus were male, might his reproductive system be affected, considering that the testes correspond to the ovaries? Until these questions can be answered definitively, PZP should not be used on wild horses, whose numbers are already so low that they could qualify as an endangered species. At one year of age, fillies are just reaching puberty. Is it ethical to subject them at that tender age to a vaccine that will wreak havoc with their ovaries, perhaps sterilizing them permanently? Is it right to masculinize a herd’s fillies? If fillies and mares are in excellent health and condition at the time they are treated, PZP can cause too strong an immune-response, resulting in long delays in restoring fertility or outright sterilization after even the initial treatment. Multiple injections are likely to result in irreversible loss of fertility. That could be one reason why PZP is not used in humans. Note that SLFO intends to administer multiple, consecutive injections. Ironically, PZP works less well in mares that are in ill health or poor condition — they are likely to conceive despite PZP treatment. Thus, the fittest mares don’t reproduce while the least fit ones — the immuno-compromised — often do. Ironically, PZP selects for horses with a weak immune system. PZP does not prevent ovulation and does not change mare behavior toward stallions. As a result, mares suffer repeated, stressful, futile breedings while the band-stallions have to battle continuously to keep their always-in-estrus mares. Out-of-season pregnancies and births occur due to the wearing off of the drug at inopportune times. Foals born at the wrong time of year may not survive, and the mares’ health may be endangered as well. There are reports of mares treated with PZP becoming masculinized. Previously, the reason for this effect was unknown. But in light of the new finding that PZP causes ovarian dystrophy, that would explain the masculine behavior. Much-less-than normal amounts of estrogen would be produced by the mares’ withered ovaries. Ironically, even though PZP is touted as a non-hormonal contraceptive, it appears to result in hormonal imbalance. Mares on PZP are less faithful to their family-band, changing allegiance over and over. Such chaos disrupts normal behavior and band-membership continuity. Band-fidelity is crucial to the survival of its members, particularly the foals. The EA indicates that BLM is aware of these adverse effects. However, by merely describing the findings of various studies, and by failing to abide by the findings that disagree with the proposed plan, BLM shows itself to be ignoring the science. However, other studies have not found that PZP helped mares be in better body-condition. Those studies found a decline in body-condition for stallions with no improvement in body-condition for mares. The EA cites two studies, both by the developer of PZP, that reported the average time it takes PZP-treated mares to recover their fertility. The mean is 3.7 years, but could be as long as 8 years. Because SLFO plans to contracept fillies and mares for five consecutive years, if those mares do regain fertility, they would, on average, be about 10 years old, but they could be as old as 14. This long delay could result in their perishing of natural causes before ever giving birth. The same study demonstrated that mares treated from one to five consecutive years returned to fertility, but mares treated for seven consecutive years did not. There could be some differences seen with the Onaqui horses as they have received the experimental drug PZP -22 and the mares in the study on Assateague Island have been given just the liquid form or ZonaStat–H. What population control is superior to PZP? Pumas. There can be no “thriving natural ecological balance” without apex predators. Mountain lions, wolves, and other such carnivores effectively control wild horse populations by targeting the weak, the sick, the young, and the old. Predators ensure survival of the fittest, as Nature intends. Therefore, the best approach is for BLM to concentrate on promoting and then protecting native predators to permit natural control of the wild horse population on the range. A puma-conservation program would tend to strengthen the herd, and it would save costs. Concerned livestock operators and nearby residents could use guardian-dogs to protect their animals. There are several specialty-breeds that have been developed just for this purpose, and they are reportedly effective. BLM might even consider buying a number of trained guardian-dogs which, per a neighboring rancher’s request, could be placed with herds or flocks experiencing attacks. Many studies have established that mountain lions prey on wild horses more frequently than previously believed. Canadian biologists found that cougars tended to kill younger animals, especially when preying on feral horses. Nearly all of the cougars’ predation-events (86%) involved animals less than 2 years old. That would take care of those six unwanted foals. Other research confirms that mountain lions are quite capable, all by themselves, of keeping wild horse populations in check. Longitudinal studies have shown that mountain lions alone successfully controlled the wild-horse population of California’s Montgomery Pass Wild Horse Territory (Turner and Morrison, 2001) and the Nevada Wild Horse Range (Greger and Romney, 1999). Interestingly, mountain lions also used to keep the Pryor Mountain herd in check until BLM had the lions exterminated in order to experiment in managing the herd using a contraceptive pesticide. The Montgomery Pass Wild Horse Territory, on the California/Nevada border, has had its ppopulation managed by cougars alone. An eleven-year study concluded that the growth of this herd was limited by cougar predation. In fact, the population actually decreased over the course of the research. The HMA should be a safe-haven for predators, which will serve as wild-horse population-control agents. There can be no true “thriving natural ecological balance” without predators. Therefore, BLM should ensure the protection of native predators, instituting a prohibition on hunting them. Conservation measures will work to enable the right number of predators to establish themselves. Large carnivores will keep the wild-horse population in check. Such an approach would favor survival of the fittest, the best genetic adaptations, and keep the herd-populations in equilibrium with minimal human-interference, just as the Wild and Free-Roaming Horses and Burros Act envisioned. Predators are the “no-cost” option. Recommendations: SLFO should concentrate on promoting and then protecting native predators to enable natural control of the wild-horse population on the range. A puma, bear, wolf, and coyote-protection program should be implemented. BLM should collaborate with the Utah Division of Wildlife Resources to prohibit hunting of predators in the HMA. Concerned livestock operators and residents of the surrounding area should be advised to use guardian-dogs to protect their animals. There are several specialty-breeds that have been developed just for this purpose, and they are reportedly effective. Protecting one’s herd is just part of the cost of doing business. To ensure the genetic diversity of the herd, the Salt Lake Field Office in 2005 released approximately 10 stallions and 10-15 mares from other HMA’s outside the state and from within the state. Since the large release in 2005, we have every 3-4 years released another 3-5 horses into the HMA. Past actions that have affected the genetic diversity of the herd are: from 2005 to 2011 the SLFO has released horses from other HMA’s to ensure the genetic diversity of the herd is not lost and/or increased. In 2005 there were approximately 10 stallions and 15 mares released. Since then we have also released 3–5 mares every 3–4 years. The released horses came from other states as well as other HMA’s within Utah. These practices evidence that SLFO’s population-management-approach is a failed strategy. If transplantation / translocation of wild horses from other HMAs — and even from other states — is necessary to support genetic viability, then the Onaqui herd is not genetically self-sustaining but is instead BLM-sustaining. Thus, SLFO is in violation of the Act and its implementing regulations by failing to provide for a self-sustaining herd. The solution is to allow a higher population, per scientific guidelines. In the future SLFO would be proposing to do selective removals with bait trapping. While doing the bait trapping we may gather horses that we don’t want to remove. Salt Lake Field Office staff will be on site to determine if the horses caught in the trap should be removed or not. Thus, BLM is essentially running a breeding program instead of letting Nature determine those horses best-suited for survival. This is not — and should not be — BLM’s role. 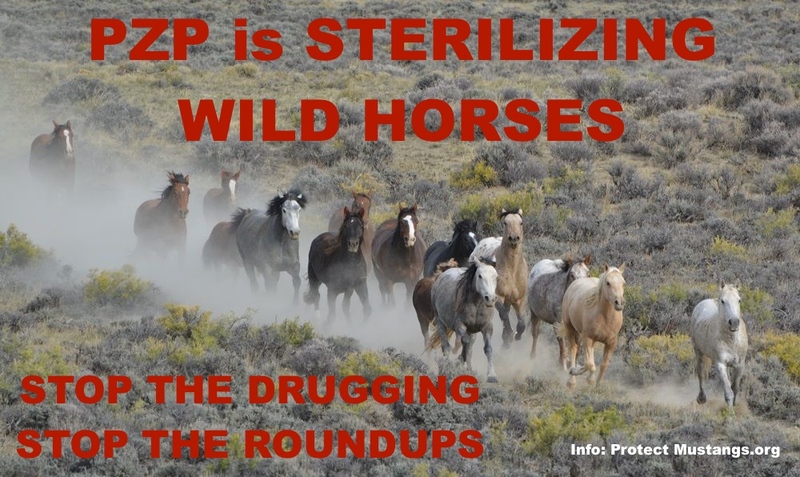 Further, the projection of future removals, in spite of the ongoing, massive contraception that SLFO proposes to use on this herd, evidences that PZP does not prevent wild horses from losing their freedom. Per Section 6.1 “References Cited,” the most recent genetic analysis on the Onaqui Mountain herd was conducted seven years ago — in 2008. There have been two gathers with removals and fertility-control actions taken since then. Now, SLFO is planning intensified contraception in the absence of genetic data. Dr. Cothran’s 2008 report was not included as an attachment, and the EA is silent as to his findings. The fact that SLFO has repeatedly imported wild horses from other HMAs and other states to increase the Onaqui herd’s genetic diversity suggests that Dr. Cothran’s analysis showed a decline in genetic variability. In such cases, Dr. Cothran typically recommends an increase in the population. However, if resources do not permit an increased population, then injecting new bloodlines is a last-ditch resort. Although the resources of the Onaqui Mountain HMA should easily accommodate a viable population, SLFO has opted to truck in horses from other HMAs. Surely this is an example of maximum meddling instead of minimal management. There should be no management-decisions made without knowledge of the genetic profile for each herd-member. No Impacts to Genetic Diversity? The EA makes the following claim about the effects of its PZP-plan: “No possible impacts to the genetic diversity of the herd as all horse would have a chance to reproduce.” A chance? SLFO evidently has not thought through its proposal because the PZP-plan would likely diminish genetic diversity to the point of causing the Onaqui herd to go extinct. Half of wild foals perish before their first birthday (Gregg et al., 2014). So, the chances are 50:50 that a mare restricted to one live foal would lose her genetic contribution. If her foal were a colt, and if he did survive to adulthood, he might never sire an offspring, resulting in both his own and his dam’s genetic contribution being zero. If the foal were a filly, and if she managed to survive to adulthood, she might well already be sterile from multiple, consecutive PZP injections, resulting in both her own and her dam’s genetic contribution again being zero. At the herd-level, genetic diversity would decline steadily, as has been the case for years now. BLM’s plan constitutes management-to-extinction. Due to the relatively long time between generations (~10 years) and the long reproductive life-span of individual horses, the loss of genetic material from the herd is relatively slow and able to be monitored and mitigated by management. Equine reproduction is indeed a slow process. If she’s lucky, a mare may produce one foal a year. Living in the wild, a mustang-mare will likely lose that foal before it reaches its first birthday. She herself may perish. All that is bad news for genetic viability at the herd-level. Hence, an optimal population is necessary. A self-sustaining herd should not need monitoring and mitigation by management. A scientifically-valid AML needs to comply with the recommendations of the International Union for Conservation of Nature (IUCN) regarding minimum-viable population (MVP) for equids. An “appropriate management level” (AML) should have a baseline — a starting point — of at least 2,500 horses. This level is the recommendation of the IUCN, the world’s oldest and largest global environmental organization. The IUCN is a neutral forum for practical solutions to conservation challenges and a leading authority on the preservation of genetic diversity in wild equids, including feral horses and burros. The IUCN notes that the selective pressures wild equids have endured in the wild are likely shaping them genetically to be hardy stock that could prove useful as a genetic resource. Because neither the present AML nor the most-recent population-figure reaches the minimal threshold of 2,500 individuals, the Onaqui herd is under-populated. The number of horses must be increased accordingly. The current HMA was carved out of a much larger herd area (HA). In that process, BLM took away 168,969 acres of wild-horse habitat. The HA needs to be reinstated as Onaqui herd habitat. The restored acres will easily support the needed increase in herd population. But can a restored HA of 375,847 acres sustain 2,500 or more wild horses at 150 acres per horse? Can the current HMA of 206,878 acres sustain 2,500 or more wild horses at 83 acres per horse? BLM’s approach to authorizing appropriate levels of livestock-grazing suggests the answer to both questions is “Yes”. HMAs are wild-horse habitat-zones. Wild horses must enjoy principal use of their HMAs. This requirement is stated plainly in the Wild and Free-Roaming Horses and Burros Act, which stipulates that their land is to be “devoted principally but not necessarily exclusively to their welfare ….” Thus, HMAs do not necessarily have to be managed exclusively for wild horses … although they can be. However, HMAs must be managed principally for the welfare of our heritage-horses. Moreover, multiple-use does not mean every-conceivable-use. Incompatible uses can be excluded, as Secretary Jewell testified during her Senate hearing after being nominated. Some examples of incompatible uses appear obvious — mining and off-road vehicles. HMAs should be designated “no surface occupancy” (NSO) areas — to preserve aesthetic and recreational values and to avoid disturbing the horses’ natural behavior. HMAs should also be declared “off-limits” to off-highway-vehicles (OHVs) — to protect the peace-and-quiet of the range and the cleanliness of the ambient air. Onaqui Mountain HMA is not being managed according to the Law because the wild horses are not allotted principal use of their habitat. Livestock — like locusts — devour the HMA’s resources. The wild horses have been displaced by encroaching livestock. This inversion must be righted, and SLFO must employ the right mechanisms to do so. First, SLFO needs to rescind this EA. Then, it must amend the Land-Use Plan (LUP), Resource Management Plan (RMP), the Final Multiple-Use Decision (FMUD), and the Herd Management Area Plan (HMAP) to conform with the Law. Livestock have been awarded nearly 5½ times more grazing slots than the wild horses have been within the HMA. (Data on livestock AUMs found on pdf-page 17 of the 2012 Cedar Mountain and Onaqui Mountain Wild Horse Herd Management Areas Capture, Treat and Release Plan.) This proportionment is obviously inverted. It must be corrected. The Onaqui wild horses must receive the majority of the grazing slots — the animal unit months (AUMs) — within their HMA. BLM may argue that actual livestock use is lower than authorized or permitted use. But because actual use is whatever the permit-holders report on Form 4130-5, and because BLM essentially takes the permit-holders’ at their word and bills accordingly … eventually … after-the-fact … maybe … or maybe not — see Bundy, Cliven — the actual-use number is unverified and likely grossly under-reported. And what has Mr. Bundy been up to lately? Since the Federal authorities backed down, he has “really enjoyed some liberty and freedoms out here.” Translation: He continues grazing his cattle on the same public lands where he hasn’t paid grazing fees in 20 years. Reportedly, those unpaid fees are now up to $1,200,000. Such abuses by permittees are likely widespread. Cliven Bundy and Kevin Borba are not alone in this regard. Utah has its share of rogue-ranchers too, as events last summer demonstrated. A Google-search to find background information on the Onaqui Mountain herd happened across an entry by kbrhorse.com. The article posted at the kbr site mentioned that, in 1991, a population-survey had been conducted. That census counted 169 horses — 158 adults and 11 foals. These results suggest a foaling-rate of 6½ percent. No PZP was used back-in-the-day, yet the natural birth-or-survival rate was below SLFO’s goal for today’s Onaqui herd. Moreover, the herd has been contracepted since 2005 with powerful and long-lasting drugs. Yet, SLFO continues to estimate its population per growth-rates that are many times higher than was the case without the drugs. The International Society for the Protection of Mustangs and Burros (ISPMB) recently completed a 14-year study of wild-horse population-growth. The ISPMB herds have been managed per the “hands-off” minimum-feasible level specified in the Wild and Free-Roaming Horses and Burros Act. Below is the link to a recent post by ISPMB, citing the low population-growth of the Gila Herd. From a starting-population of 31, after 14 years, it reached 100 members. That growth reflects an average annual increase of 8.73 percent. Per this study, BLM’s assumption of a consistent 20-percent annual growth-rate is questioned. The researchers found an effective foal-to-yearling survival-rate of just 10 percent. No matter the birth-rate, what counts is survival. The same pattern likely holds true for the Onaqui herd. Yet, SLFLO’s data painted a picture of a burgeoning population. 38 Number added. Late foals? before the gather? Who knows. that were “open” in August 2005.
still in effect, depending on mare. PZP would have had residual effect. … but that was per the added 12. 12+23=35, would have meant 28%. would have reduced the foal-crop. PZP-22 still in effect, however. The discrepancies identified herein cast doubt on the validity of the population-estimates. These errors must be reconciled before any decisions regarding birth-control or removal-actions are considered. The population-estimates for the Onaqui HMA are flawed, exaggerated. The political fallout of this error has been to keep the public in an uproar over an “overpopulation” that BLM’s faulty figures portrayed. The planned removals appear to have been hurriedly scheduled to placate the seditious elected officials and their rogue-rancher constituents, who are making a play for taking over the Federal lands in Utah. However, the wild horses must not lose their freedom merely so that BLM can kowtow to rebellious elements in the human population. If you “come clean” and admit your errors, it will tend to deflate the “head-of-steam” that the officials and ranchers are building due to the false appearance created by false figures. In May 2014, I submitted comments regarding the environmental assessment for Bible Spring Complex, which is located in Utah but is not under SLFO’s jurisdiction. Cedar City Field Office administers it. For the three HMAs and the one HA that compose the Bible Spring Complex, major discrepancies were disclosed — one-year growth-rate-estimates of 125%, 131%, 153%, 157%, and 249%. Last week, I submitted comments on Cedar City’s “public health and safety” gather of over 100 wild horses from the Sulphur HMA. A review of the population-estimates for that herd disclosed that BLM had assumed an 87-percent herd-growth rate for a particular year in which PZP would have been at maximum efficacy. A review of this EA disclosed many discrepancies that falsely made the Onaqui herd appear to be growing at implausible yearly rates. Numbers were increased arbitrarily and in spite of contraception being at full effect. Thus, the errors uncovered across these BLM-Utah field offices regarding wild-horse population-estimates are not isolated instances. These disparities point to a systemic problem. Recommendations: BLM needs to correct its mathematical errors and acknowledge those mistakes to the public. Elected officials, local permittees, and ordinary taxpayers need to know that the population-estimates previously announced for the Onaqui HMA were wrong. BLM must take responsibility and inform the public that it inadvertently portrayed an incorrect picture — an exaggerated picture — of the herd’s population. 1. Abandon the use of contraceptive pesticides such as PZP on the Onaqui Herd. 2. Amend the land-use plans to provide a robust AML whose low-bound is 2,500. 3. Conduct a 100-percent evaluation of the Onaqui Mountain herd’s genetic status. 4. Conserve and protect native predators, especially mountain lions. 5. Restore the acreage of the original Onaqui Mountain Herd Area. 6. Adhere to the mimumim-feasible-management requirement of the Act. 7. Administer the Onaqui HMA for the principal use of its wild horses. 8. Correct the population-estimates and advise the public how much they were inflated.